Although New England refuses to admit it, spring IS actually here. And although the beef stew I have planned for dinner tonight is more fitting of this weather than, say, a spinach salad, I will continue to plan my health snack Wednesdays as though Boston likes to play nice with Mother Nature. That being said, today’s healthy snack was mirrored after two of my all time favorite munchies. One is pickles (pickles- you will ALWAYS be #1 to me!). Two is something I crave constantly, but haven’t found a Boston version to match my Florida taste buds, Thai Cucumber Salad. The challenge of matching two of my favorite snacks, in a healthy way, was not so hard. I wanted sweet, I wanted spicy, I wanted cucumbers. Done! Imagine my surprise when the ingredients I threw together, in amounts I just guessed at, came out to be quite possible the perfect cucumber snack! They are not to tart from the vinegar or too sweet from the sugar. I also didn’t think they were too spicy to eat all day – although I am sure others would disagree with me on that! I did drain the rest of the marinade after 12 hours of soaking, just FYI. As a matter of fact, I don’t even want to take them to the work fridge today. I just want to keep them on my desk so I can keep on snacking on! And I think I may do just that…. Before I leave you with the recipe, tell me readers, what is your favorite road trip snack? I am looking for some road trip worthy healthy snack posts and would love your ideas! Even if you have a favorite not-so-healthy road trip snack, you know I like a challenge! Slice cucumbers very thinly (I use a mandolin slicer). You may remove the peel first or leave it on (I left it on). 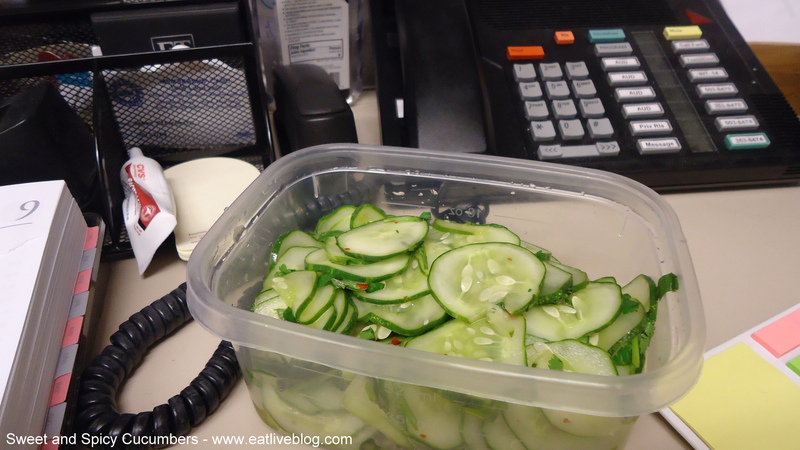 Place cucumber slices in a colander over a bowl or the sink. 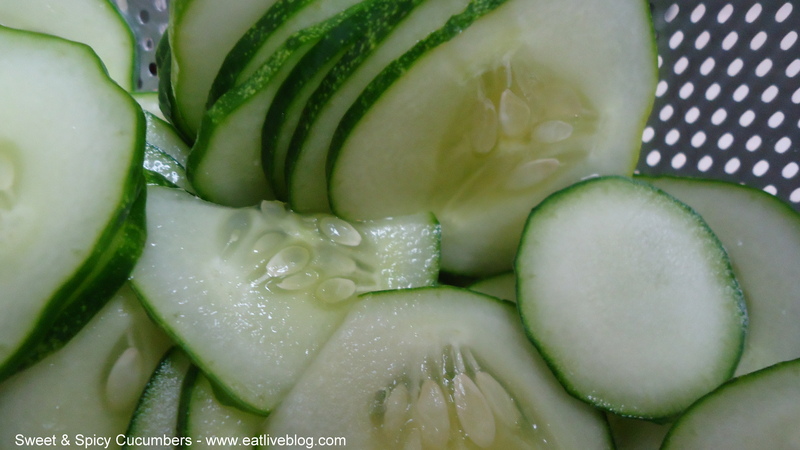 Sprinkle cucumbers with salt and allow to sit in the colander for 15 minutes. Rinse and drain cucumbers and place in your mixing bowl. Add cilantro, onion and the desired amount of red pepper flakes to the cucumbers and toss. Enjoy cucumbers as a refreshing and zesty snack, or as a side dish! 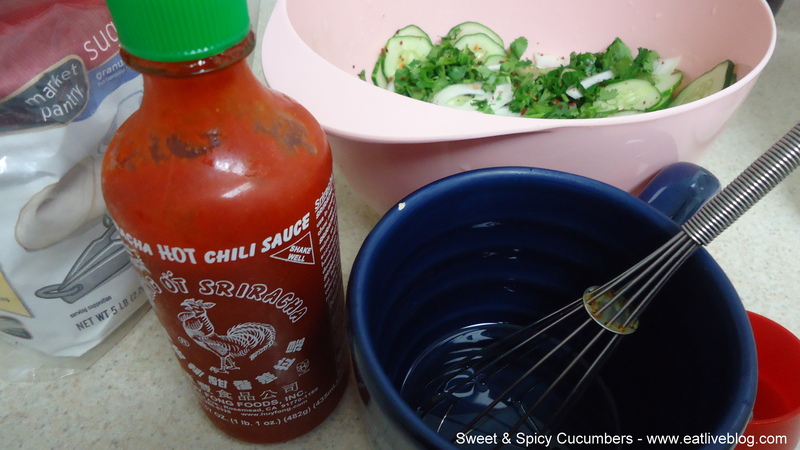 This entry was posted in Recipes and tagged cucumber, healthy snack, recipe, salad, side dish, snack, spicy, sriracha by reneeh. Bookmark the permalink. 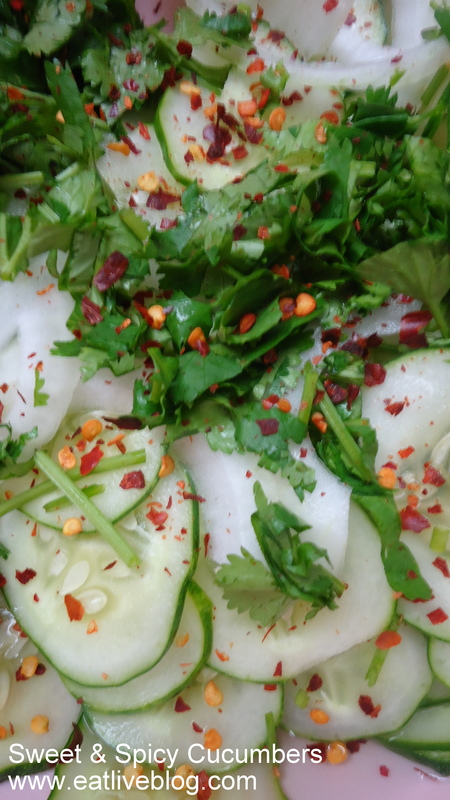 Although I’m not a huge Thai food fan, I also love the pickled, sweet and spicy cucumber salad. Thanks for the recipe. In terms of a road-trip snack, lately it’s been dried cantaloupe. Oooh…. I love the dried cantelope idea! Is the recipe on your blog? Omygoodness! This looks amazing. I’m going to make some of these to keep in the fridge. We’ve been living on sandwiches the past few days and I’m craving something healthy. Thanks Candace! Let me know how you like it! Good ol’ Classic Beef Jerky (all protein and bonus it can last for months:)….Now on a not so healthy note… I’m in search of a tasty strawberry shortcake recipe. Any suggestions? I so love beef jerky! Wonder if I can find a recipe that doesn’t use a dehydrator….hmmm….Let me look for a Strawberry shortcake recipe for you! The cucumbers sound good but maybe a little too spicy for wimpy me. I see that Sriracha bottle, and I start to cower. I sometimes make granola bars for road trips (or long flights). I love using dried cherries, chocolate, and almonds in them. This reminds me of the Polish cucumber salad that I love so much, Mizeria. Cucumber, dill, little bit of sour cream, S & P and vinegar. I could eat buckets of it. I know it well! It is very similar to the German version my oma used to make! Always have been a fan of cucumbers with just a touch of salt, or with some lemon and paprika. Love your ingredients in this — especially the Sriracha. I am definitely flagging this recipe for future use! Looks SO good! My dad makes cucumbers like this and they are amazing. Yum! Yay Paula! You clicked out of google reader!!! I feel the love! I absolutely love pickled cucumbers. Can’t wait till there in season and I buy pounds a week.